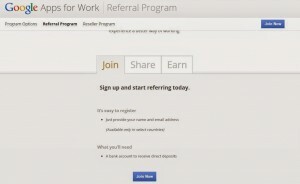 There are lots of Referral programs online. Some are good, some may work and some other may not. But, all time trusted network is Google. Now, Google launched a Best Referral Program in India and lets you earn Good money. 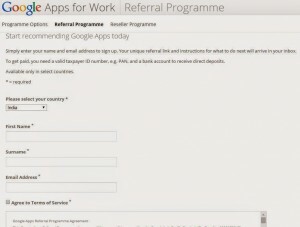 In this article, I will explain to you how to Signup/login and get into the Google Apps referral program. This is a Genuine and reliable referring program. Step 2: Fill all the required Details. After filling all the details, Click on the SUBMIT button. It will appear as follows. Step 3: After Submitting the Application, it will show an email like this. 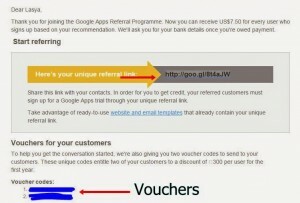 Step 4: You will get an Email from Google Apps with a UNIQUE REFERRAL ID and also you will get two unique Vouchers. You can find an Email as follows. 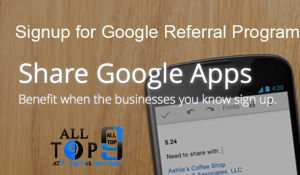 By recommending Google Apps to your contacts or your friends and if anyone sign up for Google Apps using your referral program, you will get a referral commission from Google. As of now, the referral commission is US$7.50 per sign up. If you want an own account for yourself then you can signup here for your own account. Click here To Signup Google Apps for an Own account. Open the link and follow all the instructions as it shows in site. You can distribute your referral link through emails, provided the email includes options to opt out of further emails. You should not offer any bribe/incentives/rewards for using your referral link. You should not use Google name or logo while promoting this referral program. Referral fees are paid monthly through wire transfer. There is no cookie tracking. You will earn referral commission only if the users sign up directly by following your referral link. I have 2 vouchers and I am happy to share with 2 people who ever want to get the discount on all the Google Apps. If you face any problem while signup or any other issue just comment and will be answering all the questions.